There is something so healing about a bowl of Yemenite soup. The aromatic chicken broth is liberally spiced then slowly simmered, resulting in a stock that is simultaneously complex and comforting. 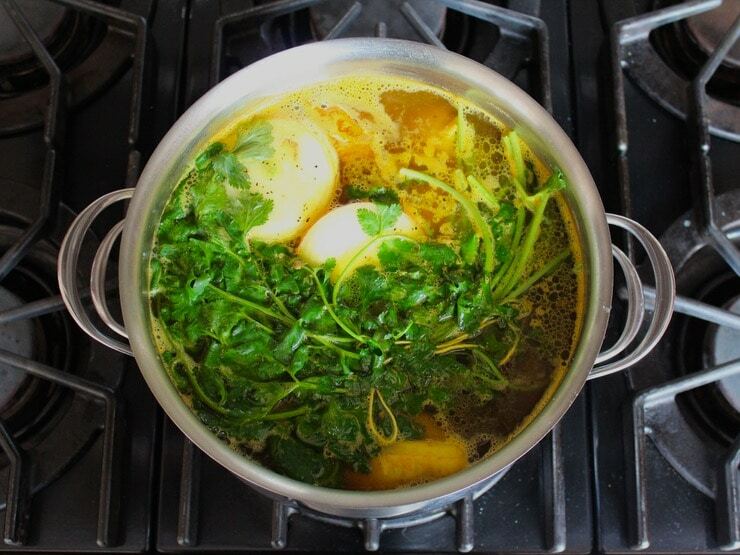 The star of this miracle soup is turmeric, an anti-inflammatory spice that gives the soup a rich beautiful golden hue. 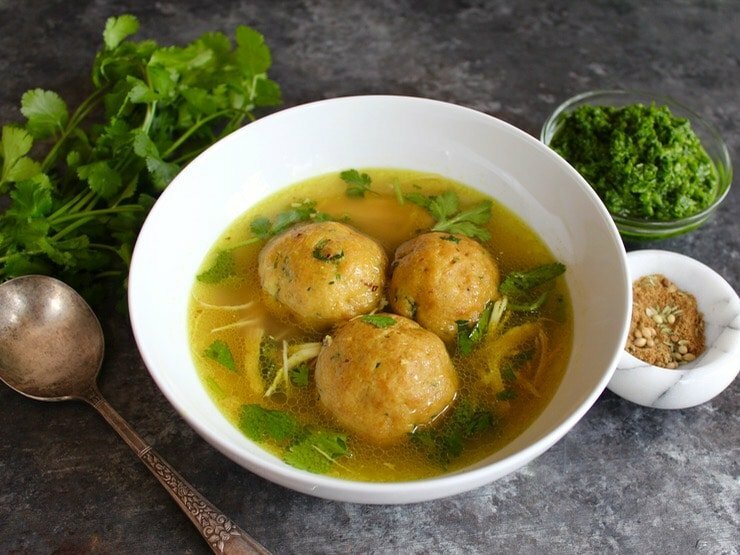 For Passover I thought it would be fun to create a fusion dish, combining my traditional Yemenite soup recipe with fluffy spiced matzo balls. The result is this Yemenite-Style Matzo Ball Soup, and it’s spectacular. It’s almost like matzo balls were made for Yemenite soup. Matzo balls are Eastern European in origin; these soft, fluffy Ashkenazi dumplings are obligatory at our Seder feast each year. Classic Yemenite soup generally features potatoes as the starch of choice, but here I have replaced them with matzo balls for Passover. While my family loves my classic matzo ball soup, they all agree that the medley of Yemenite spices brings it to another level. Add a touch of schug and you’ve got something really unique. The combination may not be traditional, but it’s certainly tasty! According to archaeological evidence, Jews have inhabited Yemen since at least the 3rd century CE. The history of the Yemenite Jewish people distinguishes them from all other Jewish communities. Yemenite Jewish tradition has remained largely unchanged throughout the centuries due to the community’s relative isolation and remote location. They have preserved many ancient religious customs that might otherwise have been lost to the passage of time. In fact, some researchers believe that the Yemenite Hebrew dialect is more closely related to Biblical Hebrew than any other dialect. In the late 1800’s a series of mass Yemenite Jewish migrations to Israel began. Facing increased persecution from Muslim communities in Yemen, most Yemenite Jewish citizens relocated to Israel prior to 1962. As of 2017, less than 50 Jews still lived in Yemen. The Yemenite Jewish history provides an interesting thematic tie-in for the Passover Seder table; these victims of persecution embarked on a difficult journey to freedom, which is a central theme of the Passover Seder story. While developing this recipe I made some adjustments to my basic Yemenite soup, ensuring that all spices used here were kosher for Ashkenazi Passover. I also recently updated my schug recipe to include a Passover-friendly spice option. Click here for the recipe. It’s a spicy, herby, garlicky accompaniment to this rich and delicious soup. A little goes a long way– just add a small spoonful for an even more amazing flavor. I shared this recipe on April 4, 2018 on Hallmark Channel’s series Home and Family, which airs weekdays at 10a/9c on Hallmark Channel. See the clip here. 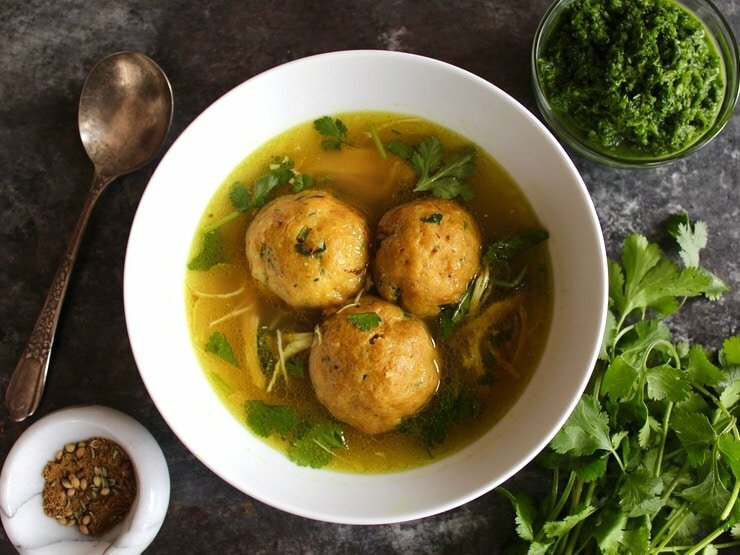 A Middle Eastern take on an Ashkenazi classic, this traditional Passover soup takes on a new personality with Yemenite spices and fresh cilantro. The chicken is slowly simmered with turmeric and black pepper, an anti-inflammatory powerhouse combination. 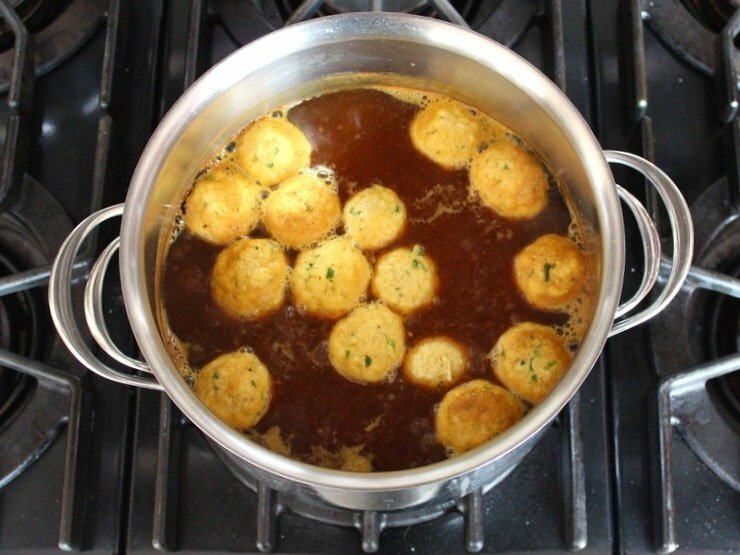 The result is a deep golden, richly spiced broth with fluffy herbed matzo balls. You will also need: 2 stock pots, 8 quarts each - one must have a lid; coffee or spice grinder; kitchen twine; mesh strainer; large bowl; small bowl. If making for Passover: Please note that some families do not use baking powder during Passover. Baking powder is mineral based, not grain based, and therefore it does not fall under the banner of “chametz,” the group of foods that are banned for Passover. There are, in fact, several brands of kosher for Passover baking powder (like this one). 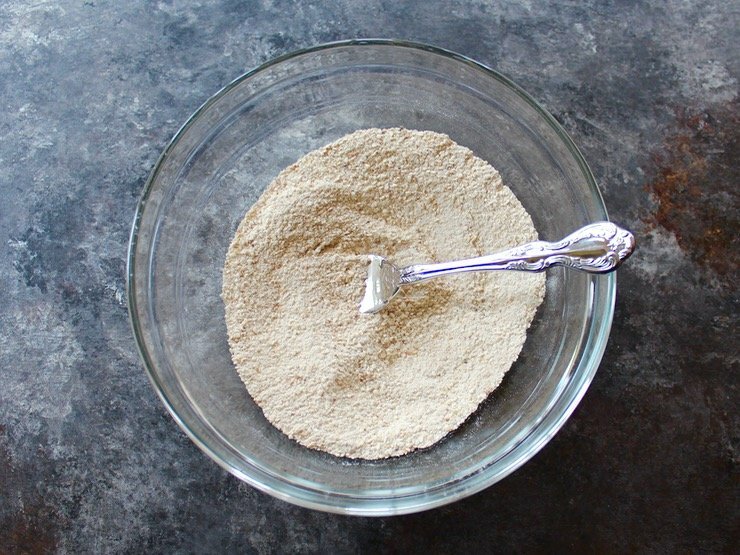 Some choose not to use baking powder because it is an artificial, non-grain-based form of leavening. Others have no problem using baking powder, as long as it has a kosher for Passover hechsher. The choice to use baking powder is a matter of tradition and preference. If your tradition doesn't allow it, don't use it. You can make these matzo balls without it and they will still be great, just not as light and fluffy. For those who do not like cilantro, fresh parsley or dill may be substituted. 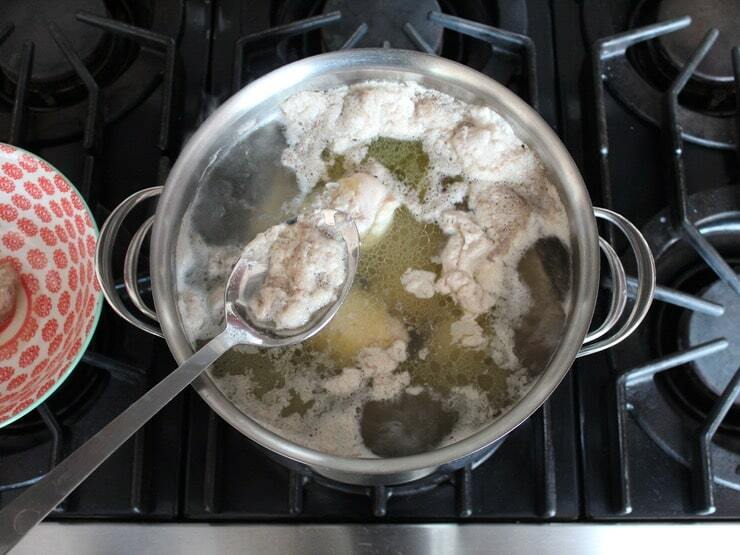 Place chicken pieces and marrow bones on the bottom of an 8 quart stock pot. Add 4 quarts (16 cups) water to the pot. Bring to a boil and simmer for a few minutes, skimming the foam that rises to the top. Discard the foam. When most of the foam has been removed, stir in 3 1/2 tsp turmeric, 1/2 tbsp salt, 1 1/2 tsp black pepper and the 3 garlic cloves into the pot. Take about 1/4 of your cilantro bunch and roughly chop it. Take about a tablespoon of the roughly chopped cilantro and mince it fine. 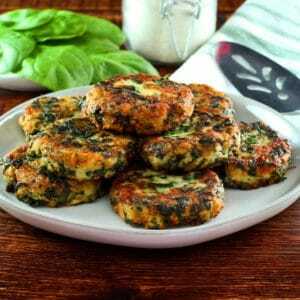 Reserve the chopped and minced cilantro separately in covered bowls in the refrigerator until ready to use. 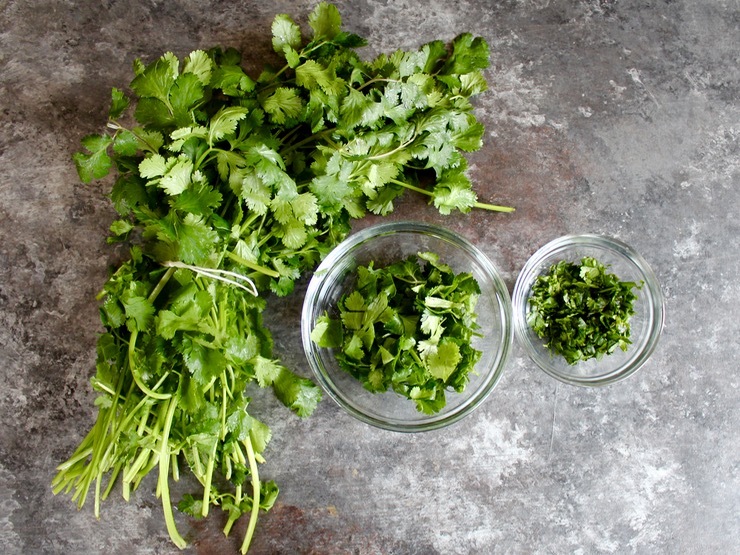 Tie up the remaining cilantro in a bundle with kitchen twine. Add the cilantro bundle and halved onion to the pot, bring to a boil. Reduce heat to a very low simmer. Let the soup cook for 90 minutes, keeping an eye periodically to make sure the simmer is low and bubbling but not boiling too rapidly. Stir gently a few times during cooking. While chicken soup is simmering, use a coffee grinder to grind together cumin, anise and coriander seeds along with the cinnamon and nutmeg. Reserve spice blend. 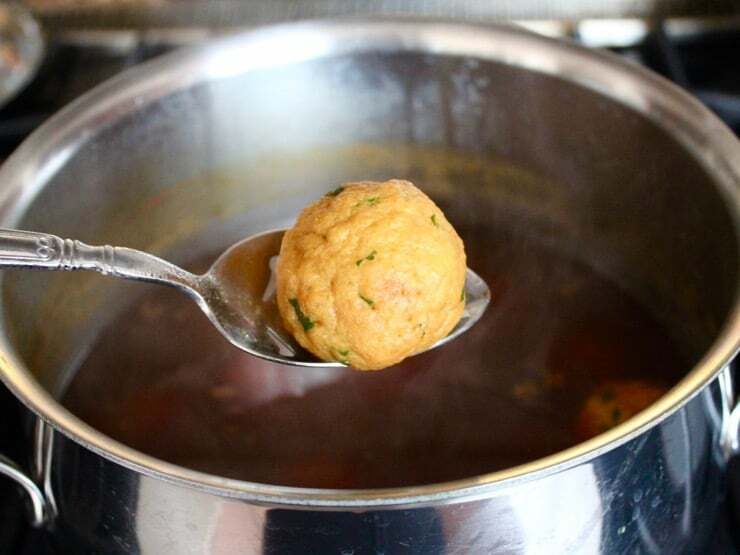 Also while chicken soup is simmering, make your matzo balls (instructions below). After 90 minutes, use a pair of tongs to pull out the onion, the cilantro bundle, the marrow bones and the chicken. Pull the chicken meat from the bones and shred into small pieces. Discard the bones and skin. 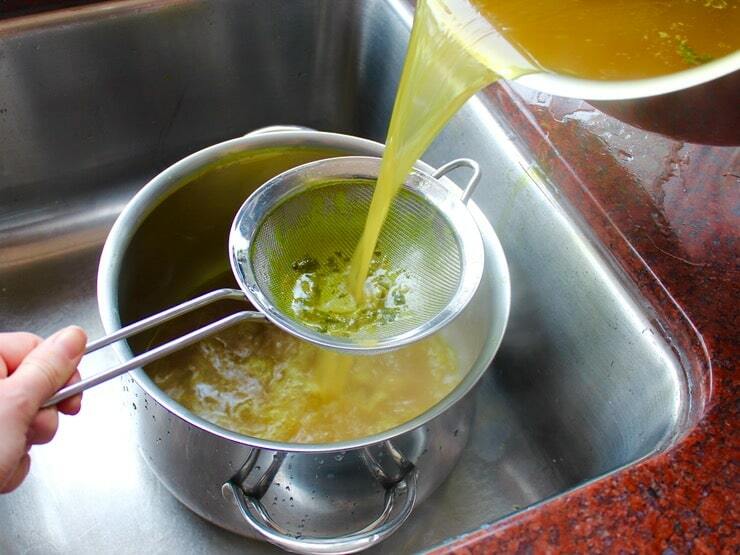 Strain the chicken broth into a clean pan or large bowl, rinse the soup pot, then return the broth to the pot. 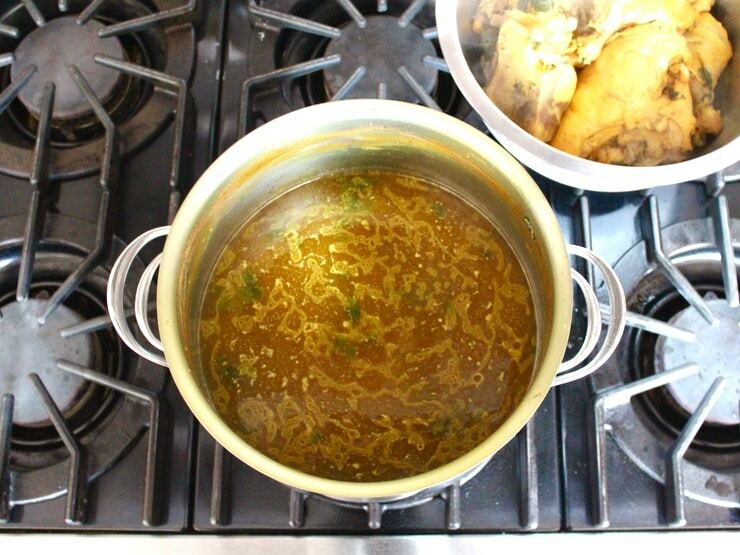 This will remove any larger spice pieces or impurities for a prettier broth. Add the chicken meat back to the soup pot. Stir 1 1/2 tsp of the ground spice blend into the broth along with additional salt and black pepper to taste. I usually add about 1/2 tsp more of salt, it really makes the spices pop. Reheat the chicken soup to desired serving temperature. Stir in the roughly chopped cilantro that you reserved earlier. Scrape the marrow out of the bones and add it to the broth, if desired, or serve the marrow bones with soup to anybody who enjoys them. 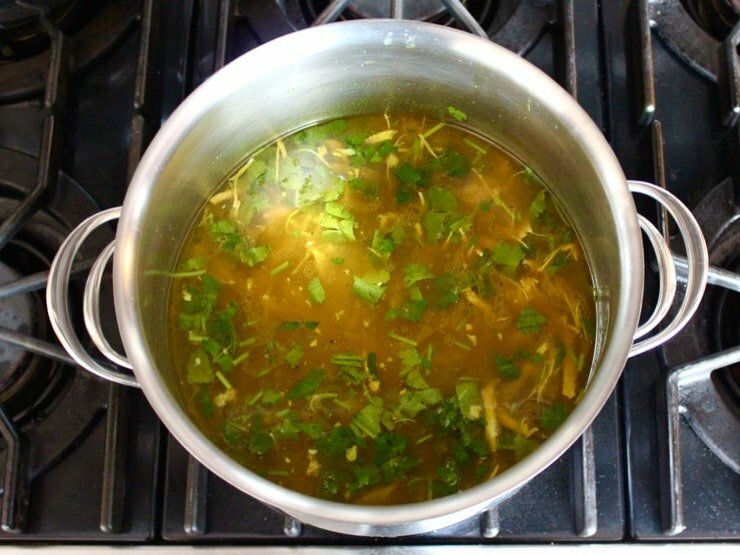 You may also discard them if you wish, their main purpose is to add flavor to the broth. In a small mixing bowl, use a fork to mix together the matzo meal, baking powder, salt, garlic powder, and onion powder. 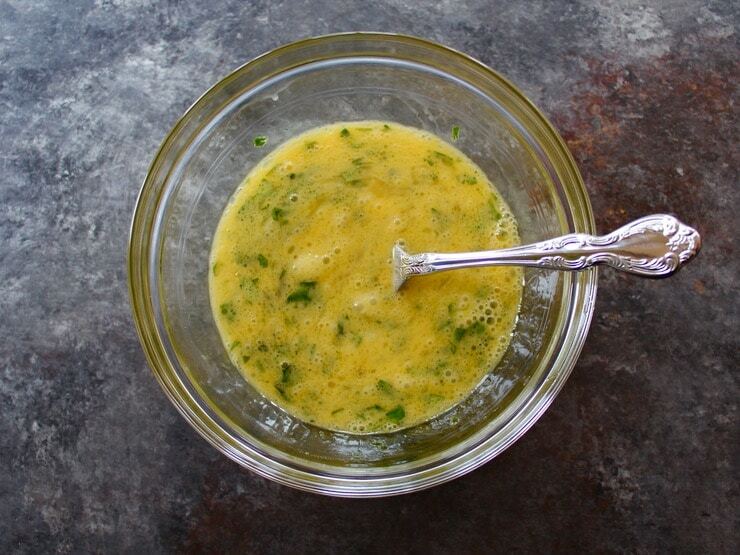 In another bowl, use fork to mix together the eggs, oil or melted schmaltz, and minced cilantro. Pour egg mixture into the dry ingredients. Mix all ingredients together with a fork until just combined. Do not over-mix. 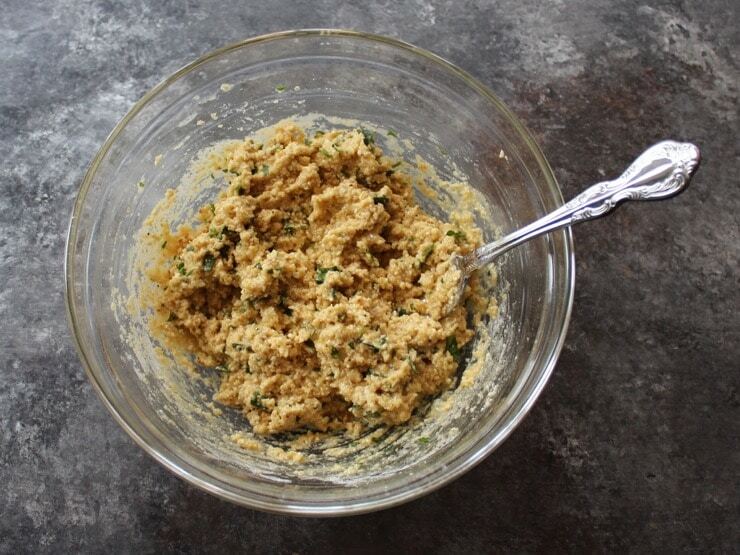 Put the bowl of matzo ball mixture into the refrigerator and let it rest for about 30 minutes. Bring 12 cups of water to a simmer over medium heat. Add 1 tbsp turmeric, 1/2 tbsp salt, and 1 1/2 tsp of the spice blend (instructions above) to create a spiced broth. Form the chilled matzo ball mixture into 1 inch balls (walnut-sized). Don't overwork the mixture when you roll the balls. You should end up with 15-20 matzo balls. Lower the spiced broth to an even bubbling simmer and drop the matzo balls gently into the liquid. Cover the pot tightly with a lid and let the balls cook for 30-35 minutes, or until the matzo balls are fluffy, soft, and cooked tender through the center. Keep the pot covered-- no peeking until 30 minutes have gone by! If you've followed instructions carefully, the balls should be floating on the surface of the water like billowy clouds of deliciousness. Be sure to cut into a test ball to check for doneness all the way to the center. If it is still dense in the center, continue cooking for a few more minutes. 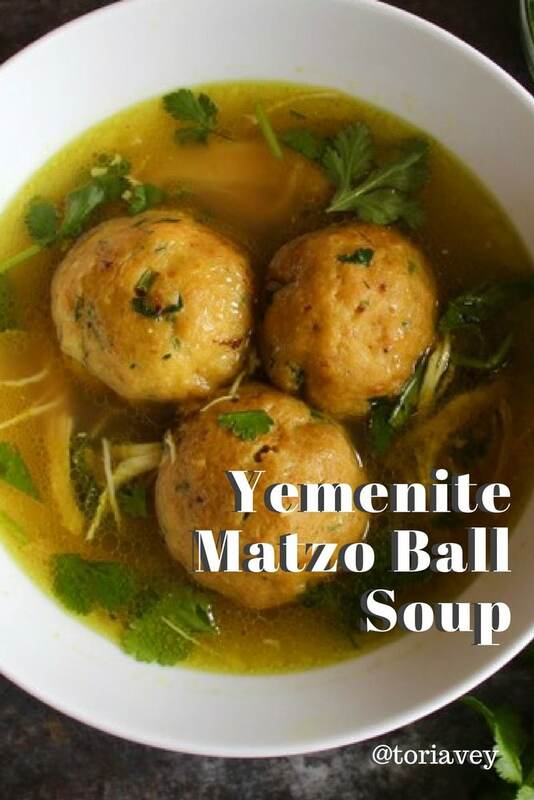 Serve each bowl of the Yemenite chicken soup with 2-3 cooked matzo balls. This soup is usually served with schug alongside, a spicy herb sauce that can be stirred into the broth to add even more flavor. If you don’t plan on serving the whole pot of soup at one sitting, make sure you remove the matzo balls from the broth and let them come to room temperature before storing them in a separate container. If left to sit in the broth for too long, they'll become mushy. Can I use olive oil in the Matza ball mix instead of schmaltz or grapeseed? Is there a reason you prefer grapeseed (I know it tastes neutral, anything else)? Olive oil can leave a funny taste in the matzo balls. You can try it, but the flavor may not be quite what you’d like. If you do that I would suggest using a very mild tasting olive oil. Didn’t have anise seeds, but aside from that made recipe as written and it is delicious. Used mortar and pestle for the seeds which worked fine; added a little cayenne for heat. Will keep this as my favorite matza ball recipe now. Everyone loved it. TORY, LOVE YOUR RECIPES! I ESPECIALLY LIKE THE FACT THAT YOU”RE NOT “FAT-PHOBIC.” THAT’S WHERE MOST OF FOOD’S FLAVOR LIES. I’M JEWISH AND I DO ALL OF THE COOKING (AND BAKING) FOR MYSELF AND MY ITALIAN WIFE. LIKE YOU, I HAD TO EMBRACE MY SPOUSE’S CULTURE AND ADAPT. I LEARNED A LOT ASHKANAZI DISHES FROM MY MOTHER, WHO WAS RAISED IN A SHTETL IN THE CARPATHIAN MOUNTAINS, AND PICKED UP ON SEFARDIC COOKING WHEN I LIVED I ISRAEL EVERYTHING ELSE IS SELF TAUGHT. 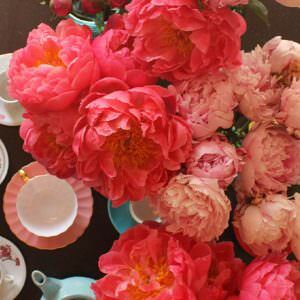 I WOULD LOVE TO SHARE SOME OF MY MOM’S RECIPES AND ALSO ONES THAT I HAVE DEVELOPED OVER THE YEARS,. HOWEVER I CAN’T DO THIS BECAUSE I REALLY DON’T HAVE ANY. FOR THE MOST PART, I SORT OF COOK INTUITIVELY. I SELDOM MEASURE ANY INGREDIENT, AND EVEN THE INGREDIENTS CHANGE, DEPENDING ON MY MOOD AND WHAT IS AVAILABLE. 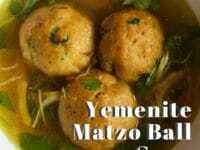 HAVE A HAPPY, MY WIFE LOVES MY MATZA BALL SOUP, SO I’LL MAKE HER SOME, USING YOUR YEMENITE RECIPE FOR EASTER!! HAVE A HAPPY PESACH. I’d like your thoughts on an alteration. I’m just cooking for 2 now, so thinking about making chicken broth the usual way, with whole chicken, aromatics, pepper and thyme. Deboning and shredding chicken to set aside, and straining broth. Then take the broth and add diced cilantro, turmeric, etc.. and let it simmer a bit, then add in the matzo balls and chicken for the final 30 minutes. That way, I save half of the shredded chicken and chicken broth for another recipe. Think that will work? 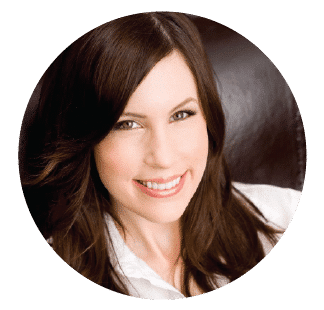 Hi Jennifer,– that should work, however I would keep the aromatics/vegetables to a minimum in the broth so they don’t interfere with the Yemenite spice flavors. Also if you don’t plan on cooking the matzo balls in a separate pot of water, I suggest only using half of the spice blend– 1 1/2 tsp. More than that will be overwhelming. Good luck! do/did yeminites eat it this way or do you imagine that they would have?